Times of the Islands – As Time Goes By . . . This beloved “Grandfather” is restored to new life. Director Patricia Saxton asked me whether I would be able to build a new wooden long case for the Robert Crawford “Grandfather Clock” mechanism generously donated to the Museum by Mr. Hugh Hutchings (featured in the Spring 2012 Astrolabe). The clock had a very interesting story behind it and being a self-taught amateur woodworker I thought the project would be a challenge that would help improve my skill base, so I readily agreed to have a go. Face board of the 225 year old Robert Crawford “Grandfather” clock. Some time later the clock mechanism arrived at my workshop and, never having done anything like this before, I thought I should do some research and learn about all things “Grandfather clock.” The internet is a great resource in this respect, especially YouTube. 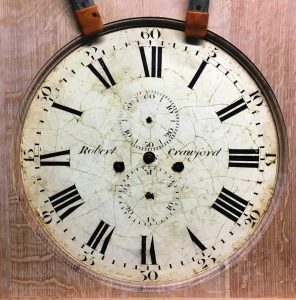 But there was very little to go by in terms of what the old case might have looked like or its overall dimensions other than some grainy photos and a picture of a clock hood with an oval face, which did not seem to fit the round face of the Crawford clock works. Hand tools used to build the clock’s case. Hand tools used to build the clock’s case. [/caption]After the rough-sawn lumber arrived, I left it to dry in my workshop for over a year. Eventually I started to convert the rough boards into something resembling workable lumber before leaving them again to settle down and stabilize for several more months while I worked out how I was actually going to build the case, and to what design and dimensions. I decided to build a full size “jig” or mockup frame made with MDF (medium density fibreboard), plywood and 2 x 4 lumber. This was essential to discover the limits of the swing of the pendulum and the travel of the weights from top to bottom. From this I was able to calculate the rough proportions needed for the entire case, which typically consists of three main parts—the base, the waist and the hood. The Crawford is a typical “8 day clock,” meaning that it takes 8 days for the weight-driven mechanism to fully descend before it needs to be rewound. “Winding” the clock merely carries the weights back to the top of the mechanism and this is performed by using a key inserted into the winder on the face of the clock. There are two separate weights—one drives the time-keeping mechanism of the clock itself, while the other powers the chimes. The familiar “tick, tock” as the pendulum gently swings from side to side merely regulates the beat or timing of the clock and is adjusted by moving the pendulum weight or “bob” up and down via a threaded bar, which in this case was with surprising accuracy for a clock over 225 years old! Once the mockup jig was completed I carefully assembled the mechanism from its boxes. The incredibly delicate hand-cut clock hands made me nervous just touching them in case one broke. Then I realized the pendulum suspension spring, suspension bracket and pendulum crutch were all broken. As there are no historical clock spare parts shops on Grand Turk, I had to find some small strips of brass and light spring steel to make new ones myself, filing them entirely by hand to the required dimensions. With everything in place, the mechanism serviced, and very lightly oiled at key bearing points, I wound the weights to the top of the movement, and a gentle swing of the pendulum was enough to bring the entire clock back to life; big grins all ‘round! The clock quickly settled into its steady “tick, tock, tick, tock,” but about an hour later it completely caught me by surprise when it started chiming! I had been concentrating on the clock timing mechanism and had almost forgotten about the chimes—yet another resplendent moment during the process! The finished clock is on display in the Turks & Caicos National Museum. Over the next several weeks the soporific “tick, tock” of the clock became a very familiar and comforting sound as I worked on the oak case or did other things in the workshop. I fiddled around with the pendulum adjustment, eventually getting it within 1.5 seconds per hour in terms of accuracy. Again, this reflects the extremely impressive craftsmanship by the clockmaker for something made entirely by hand over 225 years ago! Once I decided on the final dimensions and had a rough idea of what the finished design should look like, I set to work on building the base. Eventually I realized this was a mistake. I should have started at the top of the case, building the hood first. The roughly dimensioned boards had to be carefully selected for figure and colour match to make sure they were perfectly square and parallel, ready for the precise joinery and planing. Given the dimensions of the clock, some boards had to be very carefully jointed and glued to give me the width I needed over and above the board width I had to work with. “Quarter sawn” wood, although expensive and somewhat wasteful, is very stable as the grain orientation allows for minimum movement across its width. Another bonus is that you get to the see the beautiful “medullary rays,” or flecking as a part of the figure of the wood, which is not normally visible on “through” or “rift” sawn lumber. This figure is apparent on most of the case sides and is a nice feature of the finished clock. 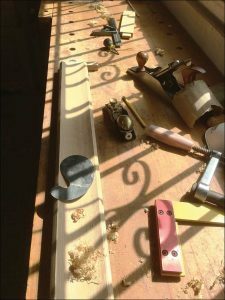 Although I used some machines—jointer, planer and table saw to convert the material into rough dimensions—most of the fine work and joinery was completed entirely by hand with hand planes, chisels, scrapers, spoke shaves for the curves, and other hand tools, exactly as it would have been when the original case was built towards the end of the 1700s. This was particularly so with some of the moldings, as I did not have the right shaper bits. I cut the large coving at the top and bottom of the waist by pushing the wood over the spinning table saw blade at 40º entry angle. It eventually produced the desired hollow form, despite the amount of scraping and sanding required afterwards to achieve a decent quality finish. By far the most challenging of the three “boxes” that make up the clock case is its hood, and my research showed that no two are ever the same. However, you have to start somewhere, so by working out the radius required to build the wooden dial board that borders the clock face, I was able to go from there and design and build the rest of the hood. I built a mock plywood form first to ensure the critical dimensions were accurate as there was no room for error in using the finish material. At this point proportions also became very important, as I felt many clock hoods I had seen images of appeared top-heavy and overly adorned. After all, this was just a simple country-style clock and not an ostentatious piece that would be at home in a palace, so I opted for a break arch pediment and a simple finial typical of the period. Glass for the face doorframe was the next hurdle as there is nowhere you can buy glass on Grand Turk. Pat Saxton came to the rescue with a glass pane from an old picture frame that could be re-cut to fit the new door. I completely messed up cutting the glass and ended hand-sanding it to the final dimensions rather than risk breaking it by attempting a very narrow cut. I turned the doorknobs for the waist and hood and the hood decorative finial on the lathe after laminating some smaller scrap pieces together to give me the starting dimensions I needed. Then I made the back of the case from solid walnut (Juglans regia), as plywood did not exist at the time the original was made. This only left putting it all together for final fitting and testing and then applying a suitable finish. I don’t like polyurethane type finishes, as you cannot feel the wood and appreciate it if it is covered in a thin film of hard plastic. I decided to blend my own finish with a mixture of boiled linseed oil, tung oil, turpentine and melted bee’s wax. I applied three coats of finish by hand with a day in-between each coat, allowing the wood to absorb it and for the finish to cure. A final buffing with a bee’s wax-based polish and after 140+ hours of work, it was all done! I thoroughly enjoyed the process, learned a great deal along the way, and I hope I did Mr. Hutchings’ donation justice. 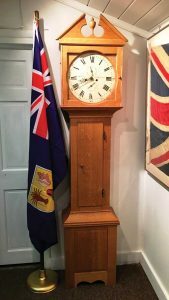 I also hope that after all the traveling and many different countries and environments the clock has endured over the years that the Turks & Caicos National Museum will be able to give it a safe, stable home for at least another two centuries! Director’s note: Thank you, Séamus for all the hard work and hours you put into making this lovely clock come to life. The first time I saw the finished product I was gobsmacked. I could not believe that the box of parts we took up to your workshop morphed into this stately Grandfather clock. I got chills when I heard the tick-tock and even more when the chimes played for the first time in decades. The clock is now on display in the 19th century Governor’s exhibit in the Museum. This clock has an incredible history, starting in the late 1700s. Crossing oceans and listening to conversations of Administrators and their families . . . the stories it could tell! Thank you Hugh Hutchings, and thank you Séamus Day!